Meet your new maybe-Mountbatten. 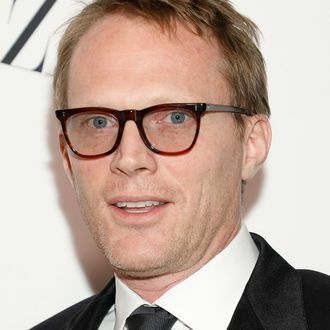 Per Daily Mail entertainment reporter Baz Bamigboye, Paul Bettany is currently “in negotiations” to portray Prince Philip in The Crown’s impending third and fourth seasons. “No deal yet but the talks are ongoing,” he writes. If true, this would make Bettany the third star of the show’s new cast to be confirmed — Olivia Colman is set to play Queen Elizabeth, while Helena Bonham Carter will be taking the reins (or rather, the reigns) as the palace’s resident party girl Princess Margaret. No other details of Bettany’s “deal” are known, but in the meantime, let’s rehash some clues Matt Smith dropped about his Philipian successor while doing late-night rounds last month: If thinking of the correct person, Smith said his replacement is “incredibly handsome” and “brilliant.” Bettany is, gasp, both. Update, January 25: Sadly, it’s back to the drawing board for Matt Smith’s successor. THR reports that, due to scheduling conflicts, Bettany has had to drop out out of negotiations to play Prince Philip. It’s fine, we made other suggestions!